When I was thinking what I should make for the final day, I suddenly remembered that I had copied some sindhi recipes from one of the earlier marathons. Manisha had blogged about sindhi dishes and I remember just copying the recipes, so I simply glanced through them and went ahead making it. Infact this was not in the plan at all, as I thought I might simply post whatever I had already made. Everybody at home were indulging, with parents wanting me to make dinner for them. They were game for any new dish that I was planning. Nothing acts more as a push than willing folks to eat my food. So I just breezed into the kitchen, after noting what needs to be taken in. 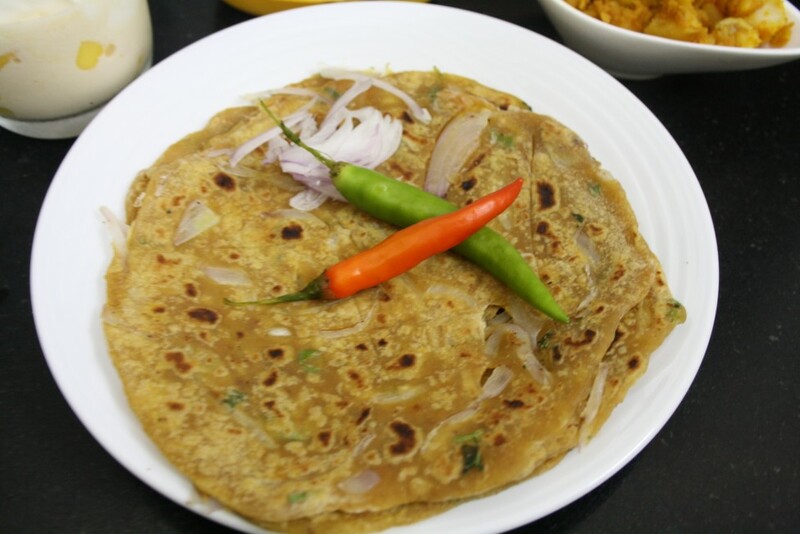 I even planned on a dessert to go with this delicious parathas. In all my haste, I failed to notice couple of things. 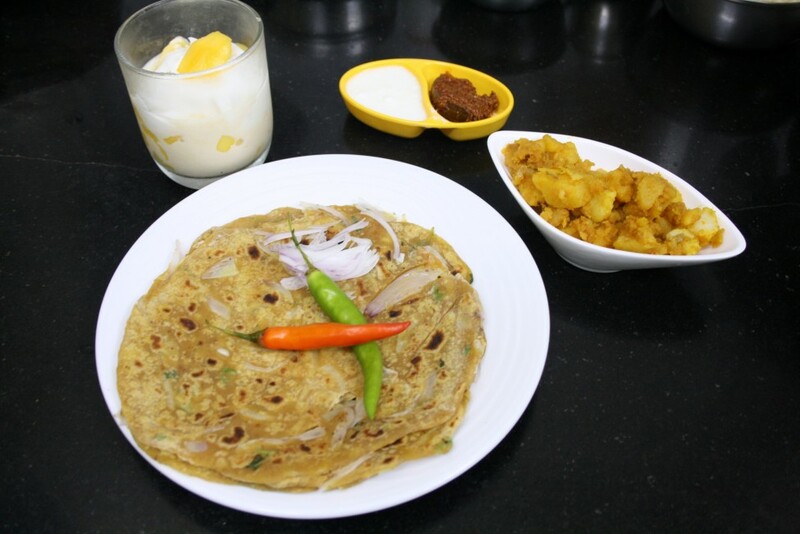 First thing is, the rotis have to be really thick, which calls for the criss cross to be made on top. 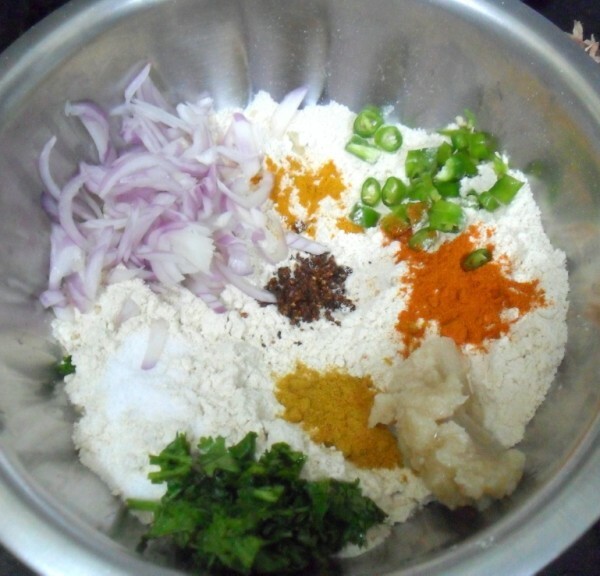 Next is, Manisha had referred Vaishali for both Masala Koki and Sindi Aloo recipes. I can point out whose recipe it is by simply looking at the recipe format. Somehow the story began with Manisha talking about her friends and it skipped my memory on what she said later. Only on the day I was checking again to read through it for links, did I notice that she was doing that week as BM paired and she did from Vaishali. Now that’s a very close circle! 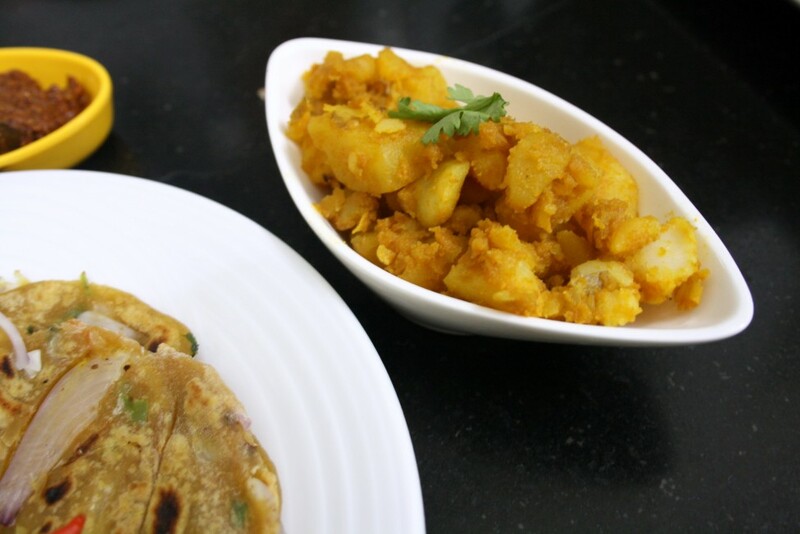 Anyway everybody loved koki and aloo. 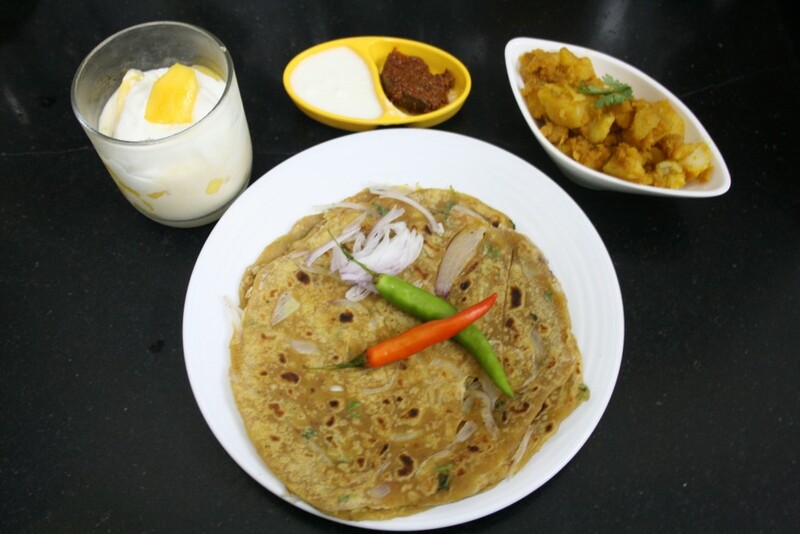 Infact koki if not for the size and anardana, is very similar to the onion roti that we make at home. And aloo had dry mango powder. so all in all it was a new taste of the old dishes. I was so glad we all had a delicious meal. I went on to read more in Vaishali about Kokis and I see that there are two varieties. One with Pepper and another Masala. I ended up making Masala Koki. Take the flour in a bowl. Add all the ingredients and mix everything. Now slowly add water and knead to a stiff dough. Divide into balls, roll them out. Mark crisscross lines on top, making sure they are not deep. Heat a tawa and cook on both sides with oil/ghee, making sure it gets cooked well. The criss cross is to ensure cooking deep inside as these are rolled thick. MW the aloos with marks on the top for 5 mins. Soak and peel the skin. 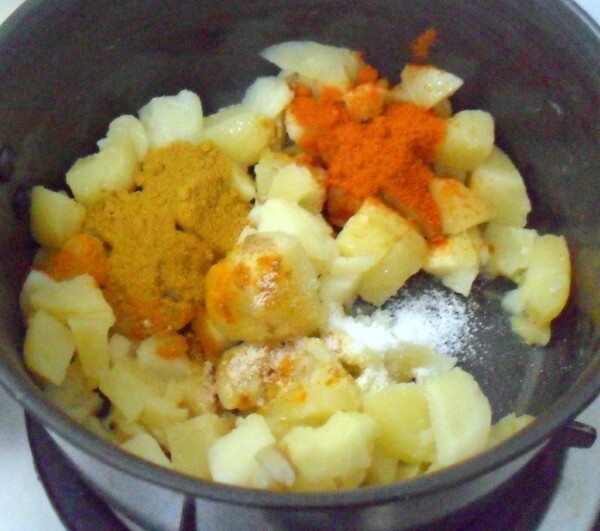 Heat oil in a non stick pan, add potatoes, salt and turmeric powder. Saute well. Then sprinkle all the other spice powders and continue cooking with lid covered for 5 mins. Original recipe calls for potatoes to be added as such. 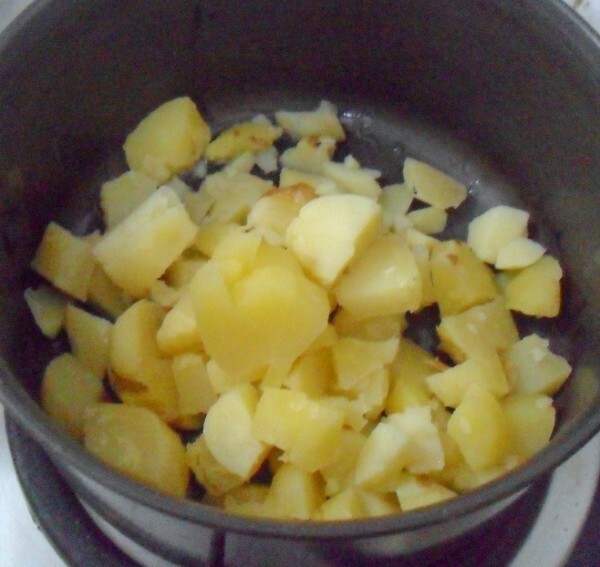 Though I know the taste and look will vary if I add boiled potatoes, I had to do it for want of time. next time will surely do this way. It was such a delicious dinner, I was so glad that Amma loved this so much. 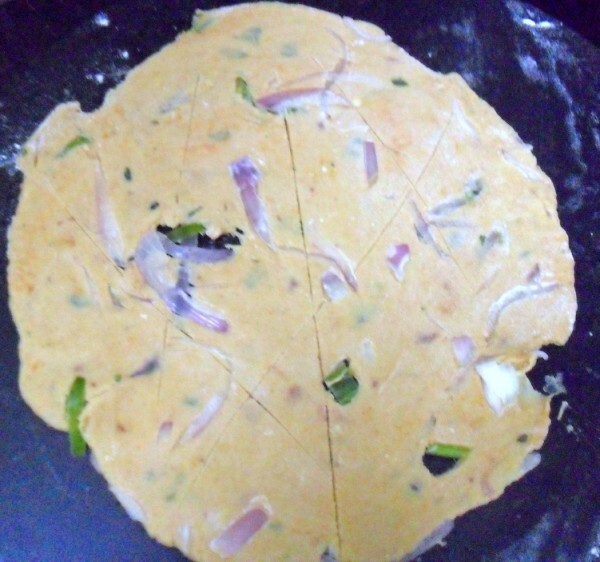 She said it was really such a long time since we made Onion parathas. So this reminded her of those days, when it used to be a weekly affair. I hope you enjoyed the Sindhi Recipes as much as I enjoyed making them. Trust me my mouth is watering.the koki looks good, but ofcourse the original one has to be really thick …practicality double.I like the mw version of aaloo..and I can see they look very good.Glad you decided on this theme, enjoyed reading all the sindhi posts for this month.loved to know that your folks enjoyed the meal. the small world of Bmers!!! That plate looks sooooo good — so yummy!! Loved making all the Sindhi dishes, a very nice change from our routine fair. Thanks for picking the theme, made me try some yummy dishes. Kokis and potatoes wat a fabulous combo,seriously i want to make some soon. Delicious looking koki,perfect with potato curry.. Both kokis and the potato dish look wonderful. Love the close up photo with the two mirchis… makes me so drool!! picture perfect! !